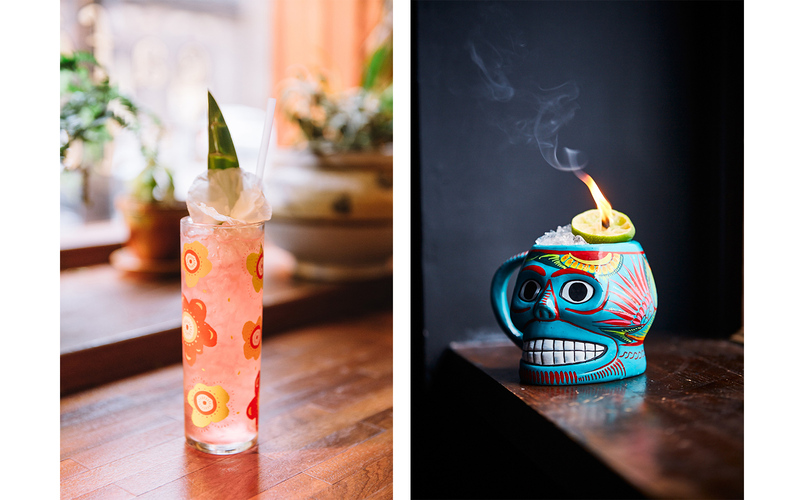 Shaking up the way we drink. The year 2018 saw the food and beverage industry swiftly respond to massive public pressure to cut out plastic straws, with establishments abandoning the single use products altogether or adopting reusable or biodegradable ones. The quick shift away from straws proved that bars and restaurants are more than ready to start eliminating single use products from their bar programs. They should also be thinking more about where their ingredients come from and how to get the most out of them to create less waste. This change is happening worldwide, and a number of bartenders based in Canada are leading the charge for sustainability in the cocktail world, one drink at a time. Trash Tiki’s anti-waste cocktails. Photos by Kyle Goldberg and Steve Ryan. 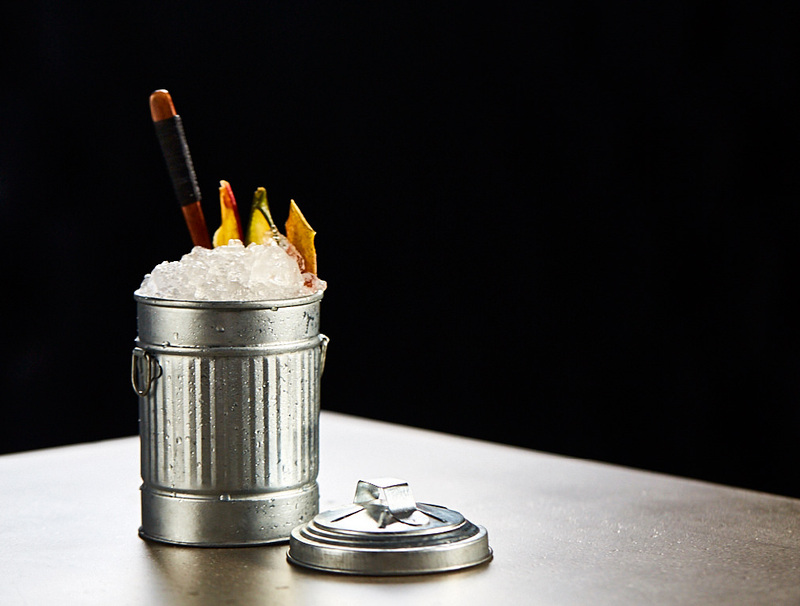 Enter Trash Tiki, a vehicle for the duo to show the industry how simple it can be for a bartender to start incorporating sustainable methods into their practice. It is part of the duo’s larger Trash Collective, a growing umbrella that includes their consultancy practice and online platform. “For the first year, we were just trying to get people to understand that they should just do what they can,” Griffiths says. This might include finding alternatives to napkins, using the spent husks of citrus fruits to make stocks, and roasting avocado pits to make orgeat syrup. Ramage and Griffiths admit their ideas were met with some resistance at first, yet they’ve been able to take their pop-up to over 70 cities since the first one (December 2016), with host bars like Toronto’s DaiLo and Chicago’s Broken Shaker often adopting the practices after Ramage and Griffiths show them how it’s done. Though their bar-hopping world tour has done a tremendous amount to further the cause, the movement in Canada isn’t solely rooted in Toronto. In 2017, Kaitlyn Stewart of Vancouver’s Royal Dinette won the Diageo World Class competition for best bartender of the year, making her the first Canadian and the second woman to be named world’s best bartender—and she did it with a zero-waste cocktail in her arsenal. Stewart made a cocktail in the competition’s sustainability challenge (one of the six) using both imported ingredients—pineapple and lime—and an ingredient local to Vancouver, sake from Granville Island’s Artisan SakeMaker. She made a gomme with the pulp of the pineapple, mixed the fresh pineapple juice with kasu (a by-product of the sake-making process), and made bitters using the pineapple’s skin, while the lime husks made a citrus stock. Every part of the pineapple and lime was used. Those elements were combined with Tanqueray and salt flakes resulting in a drink she dubbed Diced Pineapples. 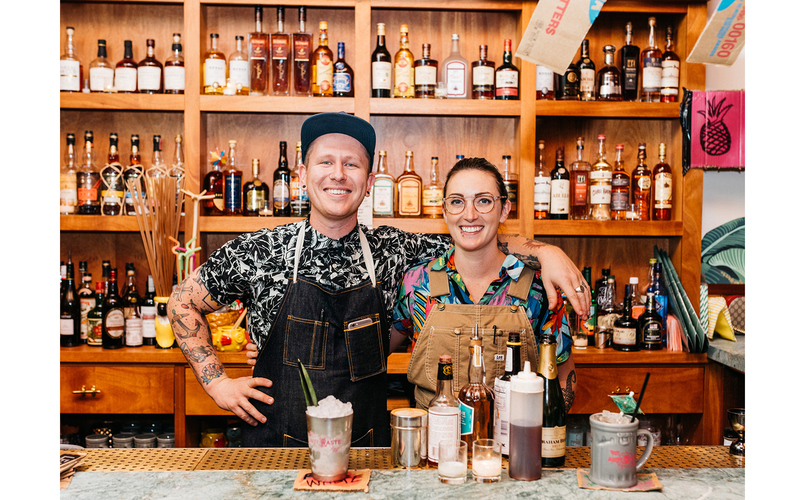 Iain Griffiths and Kelsey Ramage, the Toronto-based bartenders behind Trash Tiki. Photo by Lyndon French. For Stewart, the zero-waste cocktail movement is the bar world’s expression of the nose-to-tail movement that has swept kitchens over the past 20 years. In fact, working at Royal Dinette alongside a kitchen allows Stewart more room to explore the possibilities of the zero-waste cocktail craft. “It was easy to implement that into the bar program in terms of sharing products,” she explains. Stone fruit season saw her collecting the pits from peaches and apricots in order to make orgeat, while the kitchen makes ice cream from her leftover cherry pits. “We’re very seasonal,” Stewart says. “Our cocktail list changes four times a year. We do a lot of jarring, canning, pickling, and we make a ton of shrubs [a fruit-infused, vinegar-based syrup used in mixed drinks], so even if something isn’t available or in season, it’s still accessible.” She also believes in forging close relationships with her suppliers, focusing on the origin of ingredients, and trusting the vast knowledge of farmers and foodies alike. Stewart says she’s already seeing major players in Vancouver—including the Keefer Bar, the Diamond, Grapes & Soda, and Tocador—adopt similar approaches to and attitudes about sustainability. “Not only is it good for the environment, but it’s also really good for our bar costs,” she says. Want to learn more about the zero-waste cocktail movement? Watch this video featuring former bartender Bex Almqvist who co-founded the Green Hustle—a global initiative to reduce bar waste—with Trashtiki and Swedish bartender Hampus Thunholm. Main photo by Steve Ryan.